I can see the finish line... I've been running a marathon and I'm almost through it. I started my Aeolian shawl exactly two months ago and now I'm on the final rows. It's taken more yarn and more time than I expected, but it's also going to be way bigger than I expected. I'm so excited. I had about 600 yards of handspun silk already spun for the shawl, and I thought that was going to be plenty. However, I modified the shawl to be a little bit bigger than the shawlette as written, and consequentially the shawl turned out much bigger than the shawlette. 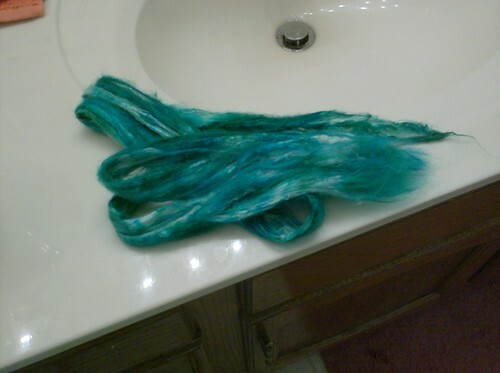 I ended up dyeing a little bit of tussah silk roving I had, to use at the end of the shawl. The color doesn't match the rest of the shawl, but it goes with it. It's interesting because the tussah is a lot 'hairier' than the bombyx silk I used for the rest of the shawl. I've just started knitting with the tussah, and it's already starting to fuzz up. I don't mind, it's just interesting to see the difference between the two types of silk. It may also be that in the past year I've been learning to not put so much twist into my handspun yarn. I've also added a few beads to the shawl - not nearly as many are as in the pattern, but a few here and there. It looks nice, but I think if I beaded the whole shawl I might have to strangle myself with the yarn or stab myself with the crochet hook. I just have a few rows to go, and I'm aiming to finish it ASAP. I am marathonning this sucker. Wish me luck. Amazing work I envy anyone that does this art.